Apps Launcher: The apps launcher houses all of the apps that have been downloaded/selected for your account. Choose Files to find your pictures and downloads. Battery: You can check your battery life here. Desktop: Similar to a PC desktop, the background of the Chromebook. You can change the desktop wallpaper by right-clicking on the desktop or by choosing Settings, Set Wallpaper. Help: You will find tutorials on getting online, photos, printing, etc. here. 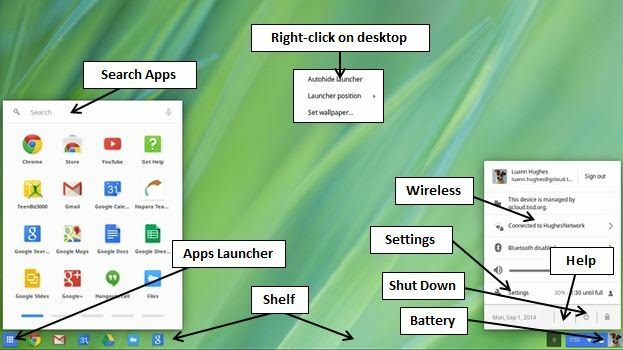 Right-click on desktop: Right-click on the desktop to change launcher/shelf and wallpaper settings. Search Apps: You can search for an app like Camera or Google Docs here. Settings: In the settings menu, you can manage your wireless connection, change the theme and wallpaper, adjust settings, change your profile picture, etc. Shelf: Also called the Launcher. Place the apps you use the most on the shelf at the bottom of the screen. Right-click the app and select Pin to Shelf. To remove an app from the shelf, right-click the app and select Unpin. Shut Down: Click here to shut down the Chromebook. You can also press and hold the power button on the keyboard. Wireless: By default, your Chromebook will connect to the TISD-Device network when you are at school. You can connect to other networks when you are outside school by selecting the network here.